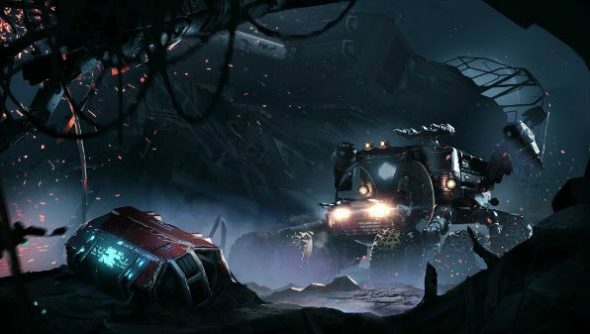 Frontier Developments, the team behind space trucking, slave trading, coffee smuggling, dogfighting sim, Elite: Dangerous, have announced the game as an Oculus Rift launch title. I wonder how many more of the titles in our picks of PC’s best space games end up on the Rift. It’s a genre that seems uniquely suited to VR. Before the Oculus Rift begins shipping on March 28, Frontier will be releasing an updated Elite: Dangerous build that supports the consumer edition of the VR headset, as well as still supporting development kits. If you want to migrate tot he Oculus Store, you can get an extra key from your Frontier account page, just like how Steam keys work currently with Elite: Dangerous accounts. In addition, the Oculus Store will be selling a Deluxe Edition bundle for new Elite Dangerous customers, which will include Elite Dangerous, Elite Dangerous: Horizons Season Pass, a starter pack of paint jobs and a bobble head. You’ll still need to sign up for a Frontier account as part of the purchase process, just like if bought on Steam. “The Elite Dangerous universe is even more fun in VR, with billions of star systems to explore, dozens of ships to pilot, and countless battles to win,” says the official blog post. All current Elite: Dangerous and Horizons season pass owners can get the Oculus version for free.